At the border crossing between Kosovo and Serbia, in Merdare, there are no trucks with goods from Serbia. 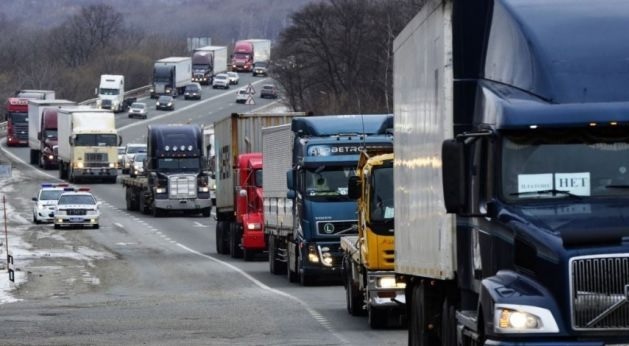 Kosovo customs officers have not allowed all trucks that wanted to transport goods from Podujeva to Pristina. They were asked to provide invoices were is written "Republic of Kosovo". They have returned and parked not far from the border checkpoint. Most of those trucks are grain and construction matrial. "We have heard from the drivers that their colleagues who have crossed the border yesterday and have tried to clear the goods, and the customs officials asked them to go back to Serbia again." Serbian journalist reports from Merdare for B92. In Jarina is another situation, says the Serbian journalist. Truckers have returned themselves since a 100 percent tax has to be paid at the border. "They have returned by themselves because they did not want to pay," the journalist said. "Those who go to northern Mitrovica have to pay here, while those who go to the south pay at the terminal of that city." According to the journalist, drivers do not want to pay.